If you lived in China between 1967-1976, you could see just eight “Revolutionary Model Works”—five operas, two ballets (of which The Red Detachment of Women was the more famous) and one symphony. Jiang Qing (Madame Mao) had trashed traditional works that promoted Confucian values and featured “emperors, ministers, scholars and beauties.” Her Model Works portrayed only heroic Gong-Nong-Bin (workers-peasants-soldiers) pitted against evil landlords, merchants and the bourgeoisie in an endless loop of class struggle. Behind these spectacles of revolutionary romanticism, the Cultural Revolution shredded social and economic stability and ruptured artistic and intellectual life in 10 years of carnage. Orchestrated by the ultra-leftist faction of the Chinese Communist party in order to dispose of its enemies, the Red Army was its instrument of execution. Jiang Qing argued these dramas were needed to “consolidate our hold on this front and hunt down reactionaries.” To enact class struggle, the masses were galvanised to participate in huge political rallies focused on denouncing “class enemies” through mock trials, public humiliation and staged “self-criticism” sessions. The ballet opens with an elegant dancer strapped to a wooden pole. She’s dressed in red and placed dead centre of a dark stage, spotlit en pointe. There are no doubts this is our heroine, slave girl Qionghua. In a cinematic sequence of scenes, we follow her conversion to a patriotic daughter of the revolution, one who must undertake class struggle and education to join the newly formed Red Detachment of Women. 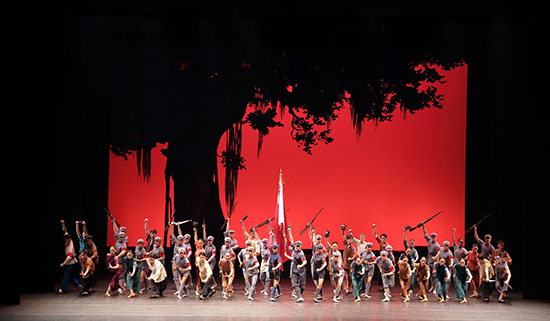 The ballet is set amid the Civil War between the Kuomintang and the Communist party. Every theatrical device is harnessed to accent the division between the landlords and the people. Dressed in semi-imperial garb, with his gang dressed in dirty brown, “despot” Nan Batien inhabits a dark and dingy stage. His lackey Lao Si almost steals the show with his acrobatic antics and comic swagger. Scenes in the “Red Area” feature boundless blue skies, palm trees and ever-fluttering flags. 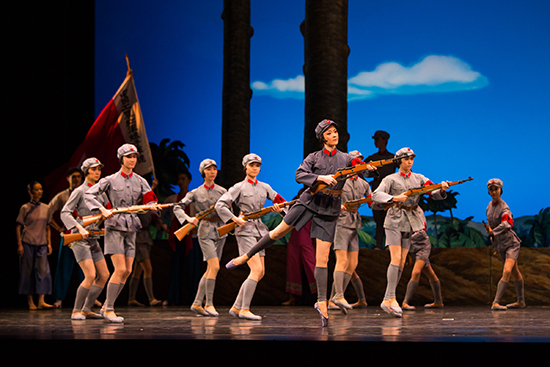 The newly formed Red Detachment of Women, with identical bobs beneath their caps, sport crisp grey shorts and pointe shoes and are equipped with pistols and guns. Their highly synchronised dancing is steeped in Western ballet; military drills inhabit, without incongruity, romantic form. Qionghua escapes the despot’s dungeon, only to be captured and left for dead. She is rescued by two scouts from the Red Army and invited to join the revolution, but not before the real hero, party representative Hong Changqing, uses her tale of misery and oppression to fire up the troops. As the score races to the final showdown, battle-scenes between Nan Batien’s rogues and the Red Detachment troops are electrified by Chinese Opera fighting choreographies. Iconic phrases from “The Internationale” and Mao’s own “The East is Red” signal imminent Red Army victory. Workers-peasants-soldiers unite to join the Red Army as dark skies on a vast scrim turn into a rainbow. Rousing victory songs are heard and Qionghua is rewarded with the ultimate political prize: the role of Party Representative. The Red Detachment of Women is performed to perfection by a large company. I swing between excitement at seeing such a vibrant rendition of a “Model” work and reluctance to validate such striking art performed, as it had once been, totally in the service of dirty politics.